In honor of International Credit Union Day, NerdWallet Looks Back at the History of Credit Unions in the U.S.
Credit unions surpassed the 100 million-member mark in June, reaffirming the strength of the federally insured system throughout the years—from the Great Depression to the Great Recession and its aftermath. Credit unions are gaining popularity among consumers who want financial benefits, fewer fees, lower loan rates and higher interest on savings accounts. In the past year alone, credit unions added 2.85 million members. This growth was the largest reported 12-month increase in more than 25 years, according to Credit Union National Association (CUNA). From the start, these not-for-profit financial co-operatives have greatly benefitted their members. The first U.S. credit union opened in 1909 in Manchester, New Hampshire, according to the National Credit Union Administration (NCUA), which regulates, charters and supervises federal credit unions. However, it was not until the Great Depression that these financial institutions were organized under federal law. President Franklin D. Roosevelt signed the 1934 Federal Credit Union Act at a time when Americans had very little faith in banking institutions. The law was intended to make credit available to people at all economic levels and to promote thrift. By the end of 1940, there were 3,756 federal credit unions in the U.S.
By 1970, Congress had created the NCUA as well as the National Credit Union Share Insurance Fund to back share accounts in all federal credit unions, as well as most that hold only state charters. At first, credit union membership was open only to a well-defined community, such as residents of a specific town or county, or the employees of a particular company. In the 1980s, membership criteria were loosened, allowing more flexibility in who could join. By then, the services credit unions could offer had been expanded to include share certificates and home mortgages. In 1985, credit unions insured by the fund received the backing of the “full faith and credit” of the U.S. government. Banks, which compete with credit unions, challenged looser membership rules, and in 1996 and 1997, the federal courts backed those challenges. But in 1998, President Bill Clinton signed the Credit Union Membership Access Act to restore membership flexibility. During the financial crisis that spawned the most recent recession, Congress took a number of steps to help banks and credit unions handle fiscal stress. One, a temporary increase in share insurance protection to $250,000 from $100,000, matching the Federal Deposit Insurance Corp.’s backing of bank deposits, was made permanent in 2010. Today, about a third of all Americans belong to credit unions, which hold $1.1 trillion in assets, according to NCUA figures. How do credit unions offer better deals? Unlike for-profit banks, credit unions are member-owned organizations operated democratically and overseen by volunteer directors. They are exempt from federal and most state taxes, a status that has drawn challenges from bank groups, who say it provides an unfair competitive advantage. Credit unions say their status is appropriate because they exist to serve members, not make a profit. Credit unions return earnings to members in the form of lower loan rates and high interest on deposits. For example, the national average credit union rate for a 36-month used car loan was about 2.7% in the second quarter compared with the almost 5.3% average bank rate. Meanwhile, a five-year share certificate with a $10,000 minimum carried an annual yield of more than 1.3% compared with the less than 1.2% average bank yield. Depending on the individual credit union, other financial benefits may include truly free checking accounts for students, seniors and businesses; a larger network of surcharge-free automated teller machines; mobile banking apps; and interest on savings that beats that of most banks. Because credit unions are managed for the benefit of their members, they’re often able to provide more personalized service than banks can. Credit unions have a long history of providing Americans with a stable source of loans and a secure place for savings. These institutions have proven their ability to weather even the bleakest economic climates, so there are plenty of good reasons to join one. After all, can 100 million people be wrong? 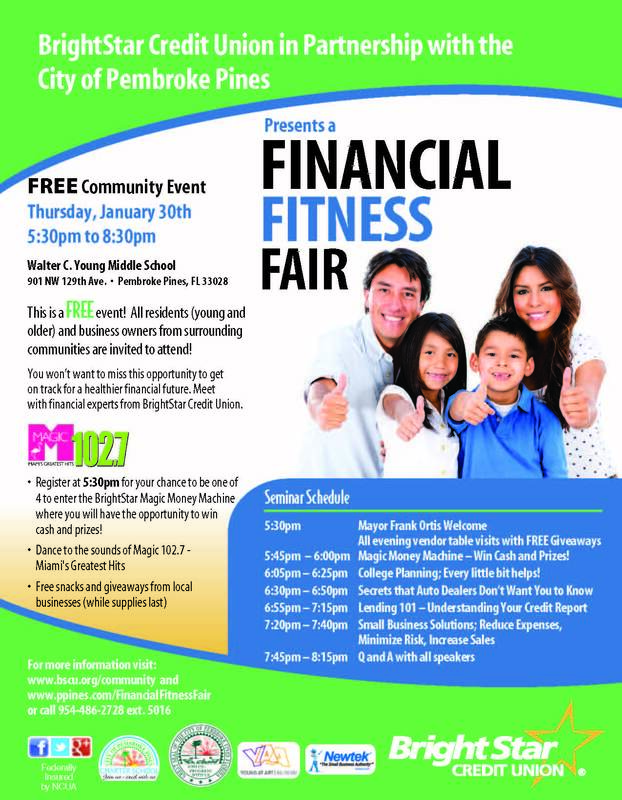 Mark your calendar and plan to attend BrightStar Credit Union’s Free Financial Fitness Fair, Thursday, January 30, 5:30 p.m. Get on track for a healthier financial future. Free seminars, snacks and giveaways. Location: Walter C. Young Middle School (901 NW 129th Ave, Pembroke Pines, FL 33028). Click the image for more information. As your teen transitions into adulthood, they’re experiencing many firsts, including a first job and a first paycheck. This is the perfect time for them to start managing their own financial products too. Even if they’re not 18 yet, they can still open their first checking account with your co-signature. A checking account is a crucial stepping-stone on your teen’s journey to full financial independence. Let them practice now, while still under your watchful eye, and they’ll have a clear advantage over their peers when they leave for college or start their first full-time job. Here are four strategies to help your teen use their account to the fullest. You know all too well that your teen is unique. Accordingly, not all teens are ready to handle a bank account at the same time. When deciding whether or not you should open one together, focus on your teen’s level of maturity and previous experiences handling cash, rather than their age or year in school. Some teens can handle a bank account at 14, while others may need an extra year or two. Either way, they’ll have plenty of time to practice money management before they move out, so don’t feel the need to rush things. Even though you’ll be a joint account holder until your teen turns 18, let them take the lead on managing their money. They should be the ones checking their balance, making ATM withdrawals and using the debit card to make purchases. This is the only way they’ll get better at it. Continue to talk with them about budgeting and responsibility. Let them know you’ll always be available if they have questions. You’ll ultimately have the final say as to how your teen manages the account, but they should still feel like they’re in control of their money. The best teen checking accounts are free, meaning your teen should not have to pay any minimum balance requirements or monthly fees. Fortunately, BrightStar Credit Union’s checking account is free, no matter how old you are. However, there may be other fees your teen needs to worry about. Your teen may be charged a fee for an overdraft or using an out-of-network ATM. Go through all the checking account’s boring documents, including the fee schedule, together. Don’t hesitate to ask a BrightStar representative for help if you don’t understand something, or just need clarification. Before computers and smartphones were invented, balancing your checkbook and reviewing your monthly statements were essential skills for anyone with a checking account. They’re still important, of course, but online banking has made them easier than ever. Your tech-savvy teen can easily manage their account right from their computer or smartphone, which will help them stay on budget. BrightStar has mobile apps for your phone and free online banking. Make sure you talk about online safety first, though. Banking online can be dangerous in public places, and you don’t want your teen to become a victim of identity theft. Laura Edgar is a senior writer for NerdWallet, a consumer finance website that helps you with planning your financial future. Laura Edgar is a senior writer for NerdWallet.com, an unbiased personal finance website committed to promoting financial literacy. 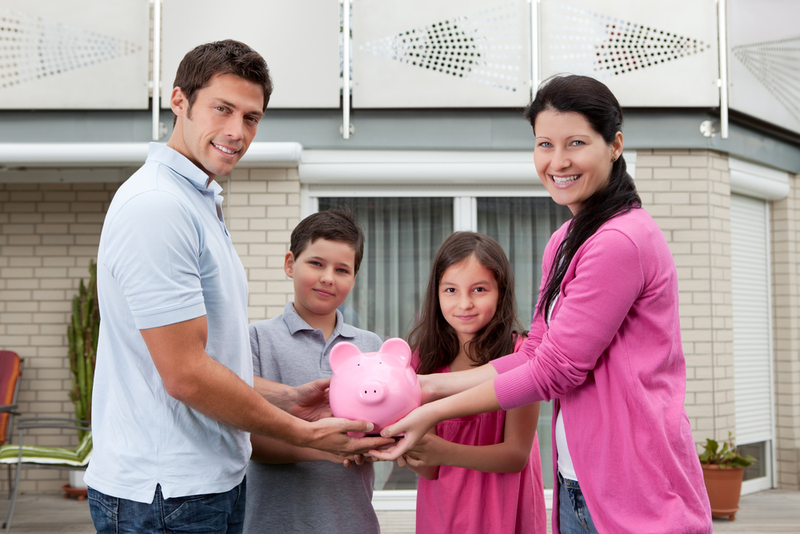 Money management is one of the most important life skills you can pass on to your children. Once they’re old enough to manage their own money, they’re more likely to use it wisely if they already have good spending habits to fall back on. Study after study confirms it! That said, it’s not always easy to know how to approach the subject. Here are some great strategies to make your next money conversation easier. Kids love money. Don’t worry about the conversation being “too boring”. Money is only boring when you frame the conversation that way. Don’t say, “Let’s talk about grown-up things because it’s good for you.” That’ll bore anyone! Before you talk about mortgages or credit cards, your kids need to understand basic money management concepts like saving, budgeting, and working with cash. With cash, kids can literally see money coming and going, which will help them internalize concepts like spending and saving. If your child is older, a savings account is a great way to introduce them to banking and encourage them to save for something big. BrightStar’s Cosmos Kids Club is a great savings program for kids 13 and under. If your child is a teenager, a checking account will help them practice managing money and paying for their own expenses. When used correctly, credit cards and loans can help people afford good things like a car, a house, or a university education. However, people need to be really careful because too much debt is definitely bad. Credit cards and loans aren’t “free money”.Paying your bill in full each month is the best way to avoid trouble. It’s always a good idea to brush up on personal finance basics before you talk to your kid. BrightStar University has an excellent collection of games, articles and videos to improve your financial literacy at any age. Check it out and start your money conversation today. BrightStar CU is a partner with Broward County Public Schools and their Academy programs. Our partnership includes supporting several student-run credit unions as well as helping teach kids personal financial skills. 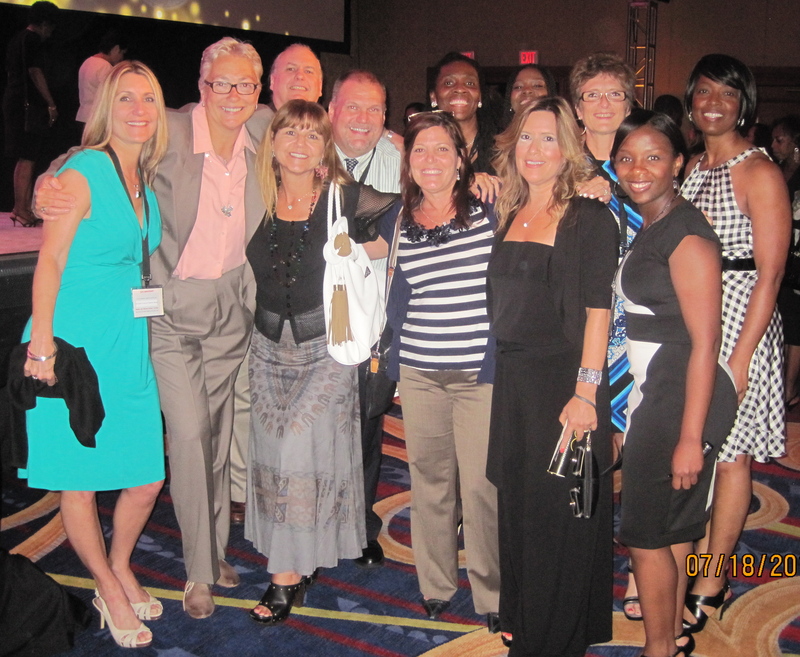 Sam Chesser, BrightStar’s VP of Marketing, recently accompanied several Broward County Academy teachers at the National Academy Foundation’s annual conference in Washington, D.C. You can see Sam’s head peeking out from behind NAF executive Director, JD Hoye, in the accompanying photo. The Broward group had a great experience at the conference which focused on ways to help prepare students for college and career success. NAF has a proven educational model which includes industry-focused curricula, work-based learning experiences, and business partner expertise for: Finance, Hospitality & Tourism, IT & Engineering. Way to go, Broward County! We have several shining stars (high school interns) with us this summer at the Credit Union, and we’re excited to tell you about them. Each intern is studying finance at their school, and their internship at BrightStar is helping them complete their course work. We’re proud to have them as part of our team! What I’m excited to learn about during my summer here: I am excited to learn how about Credit Union works as well as learn about the different services offered. I am also hoping to learn about the financial business world. Random Fact: I love DECA (DECA is an international association of high school and college students studying marketing, management and other business related skills.). Random Fact: Out of all three of my brothers I am the shortest one. What I’m excited to learn about during my summer here: I’m excited to learn how the EFT department really works. I would cherish learning more about how the credit cards, the debit cards, and the checks work. Also I would enjoy experiencing the transactions that occur on a daily basis. Plus it would be wonderful to gain knowledge about credit history and how to acquire a better credit score. What I’m excited to learn about during my summer here: I would really like to learn about how financial institutions work so that I can gain a better understanding of how businesses work as well. BrightStar Credit Union’s financial literacy website, BrightStar University, was recently named a top pick for “Best Multimedia Collection” by NerdWallet.com. BrightStar University offers a variety of free resources, lessons, curricula, games, podcasts and more—all designed to help improve your financial knowledge. The site is divided into age groups with handy tools for kids, middle schools students, high school students, college students, adults, parents and teachers, and also information in Spanish. We’re honored to be featured on the NerdWallet blog. Be sure to visit BrightStar University the next time you need to brush up on your money smarts. NerdWallet.com, a personal finance website committed to promoting financial literacy and spreading the word about consumer-friendly banking. Free online “university” teaches about personal finance.